On Valentine’s Day, show your love to your neighbor. Every neighbor. Including your immigrant, refugee, undocumented, DACAmented neighbor. I’m Ready To Share the Love. Sign Me Up! 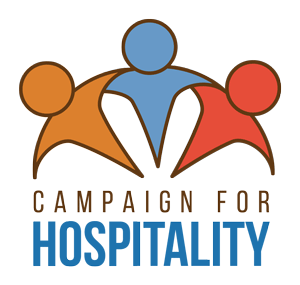 Invite an immigrant rights activist, member of your school or parish community, or representative from a local social services or legal aid agency serving immigrants and refugees to share their story. Encourage your elected representatives to love their neighbor. Create cards using our handy template and plan a visit to deliver Valentines to your Congressperson’s local office during the February 19-23 Congressional recess. 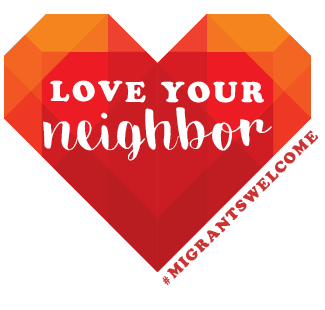 Display your “Love Your Neighbor” sticker or printable sign and share via Twitter, Instagram, and/or Facebook with #MigrantsWelcome. Compose a personal message about why you love your neighbor. Raise funds for organizations offering immigration-related legal aid with Valentine’s Day Fair Trade Chocolategrams! Order chocolate bars wholesale from Equal Exchange, use our template to create tags, set a selling price, advertise at your organization, and donate proceeds! Need help finding an organization in your community?